If you're looking for a reliable camera with a decent zoom range and that is capable of producing good quality images – without too much input from you – the SX600HS is a good option. 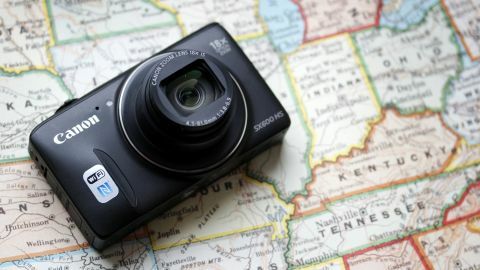 The travel sector of the compact camera market is proving to remain robust in an otherwise declining market. What these cameras offer that smartphones can't is a high zoom lens. The SX600 HS offers an 18x optical zoom in a body which is slim and compact. Camera manufacturers know, however, that they still need to pack dedicated camerass with lots of additional extras to make people fork out for and carry around an additional device. Along with the 18x optical zoom lens, there's also a 16 million-pixel 1/2.3 inch back-illuminated CMOS sensor – that's larger than the typical smartphone sensor. There's also a Digic 4+ image processor, which although a couple of generations old now, has still proven to be a good performer in the past. That 18x zoom lens doesn't have a wide maximum aperture, starting at the relatively narrow f/3.8 at the widest point, rising to f/6.3 at the telephoto end of the optic. If the 18x optical reach isn't enough, there's also the option to engage ZoomPlus, Canon's digital zoom technology, up to 36x, and yet further using standard digital zoom to boost that up to 72x. This is not a camera designed to appeal to very experienced photographers, and as such most of the modes on the SX600 HS are automatic. The most control you'll be able to take is when using 'P' (Program) mode, which allows for parameters such as white balance and metering to be controlled, but not shutter speed or aperture. Instead, this camera is designed for those who want decent image quality without having to worry too much about changing settings. As such, there's also a number of features that should appeal to those who are at home with Instagram and other image editing apps. One fun feature of the SX600, which we've seen on several other Canon compacts, is the Hybrid Auto setting. This films a two-second video before every shot is taken, then splices them all together at the end of the day to give a video recap of your day – it's particularly nice for parties, holidays and other special occasions. There's also a Creative Shot mode that applies a number of digital filters to an image to give you a variety to choose from. There are some other filters to be found in the standard automatic mode that give you more specific control over which filter to use. In Program Mode you can also experiment with 'My Colors' to give different effects too. It's starting to become an industry standard now, but the SX600HS has built-in Wi-Fi and NFC technology. This means you can send images across to a smartphone or tablet for sharing quickly on social networking sites, which again should appeal to mobile phone camera users. NFC connectivity means if you have a compatible device, then simply touching the two devices together will start an instant connection. Canon has played it pretty safe with the rear LCD screen. It's a 461,000 dot fixed, non-touch sensitive screen, but it is still fairly large at 3 inches. Another specification that we more or less expect to see is Full HD video recording, and the SX600 HS does not let us down. Videos can only be a maximum of 10 minutes long each though, as opposed to the SX280's ability to record up to 29 minutes and 59 seconds at a time.